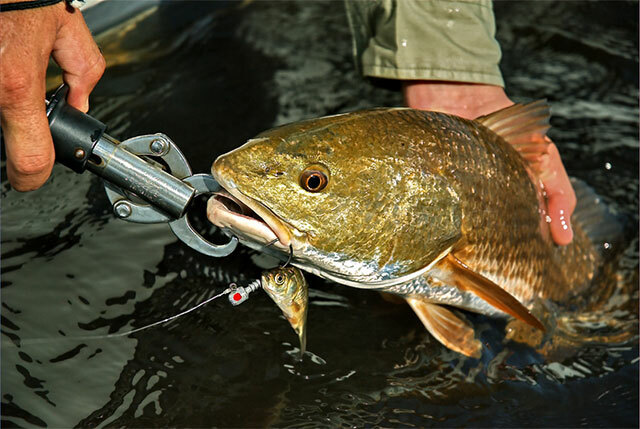 Fishing lure manufacturers spend millions promoting new products. The number of new artificial baits produced each year is astounding. Change doesn’t occur as fast in the live-bait market, however. Redesigning a piece of balsa or plastic is much simpler than redesigning a living creature. Consequently, “new and improved” natural baits are seen about as often as 5-pound crappie. That is to say, not very often. It happens occasionally, though. Advances in bioengineering and aquaculture techniques make it possible to “manufacture” new, never-before-seen creatures, and some of these modernistic mutants are dinner in the eyes of hungry gamefish. Such is the case with the Black Salty, a sensational live bait gaining fans nationwide. The Black Salty is technically a goldfish, but this isn’t your garden-variety goldfish. The Black Salty is specially bred and pond-raised by I.F. Anderson Farms, a 60-year-old bait hatchery in Lonoke, Arkansas. Anderson biologists use a proprietary, patent-pending process that enables this freshwater baitfish to stay alive on the hook in saltwater for up to 1 ½ hours. The fish also are selectively bred to achieve a gold/silver color, which serves well to mimic baitfish from freshwater shad to saltwater mullet. Proven Effective: Black Saltys are extensively field-tested and proven to consistently outperform native live bait in freshwater and saltwater. Always Available: Can be purchased 12 months a year. Super Convenient: Black Saltys can be shipped directly to the consumer via Federal Express overnight delivery. Time & Work Savers: No more getting up early and working hard to catch bait … bait that may not even be there. Vigorous: In waters fresh and salt, Black Saltys are livelier on the hook than anything else on the market. Cost Effective: With Black Salty baitfish, there’s no waste. Take home unused bait and store it in an aerated freshwater well. Extremely Hardy: Black Saltys will live months in a treated, aerated baitwell. Environmentally Friendly: Pond-raised by Anderson Farms in Lonoke, Arkansas, Black Saltys are not harvested from fragile bays, estuaries and lakes. In the few years it’s been available, the Black Salty has impressively proved its mettle on a wide variety of saltwater and freshwater gamefish. When fishing inshore saltwater, the Black Salty is deadly on speckled trout, redfish, flounder, black drum, Spanish mackerel and many sharks. Black Saltys also account for all popular surface species, including king mackerel, cobia, dorado and bonito, along with red snapper, grouper, amberjack, tuna, tarpon and wahoo. In freshwater, the Black Salty has proven extremely effective for striped bass, hybrid stripers, largemouths and catfish. Brad Wiegmann, a fishing guide on Arkansas’ Beaver Lake, started using Black Saltys in 2005. “I’ve used Black Saltys to catch every type of bass swimming in Beaver Lake, including largemouths, smallmouths, spotted bass, stripers, hybrid stripers and white bass,” Wiegmann says. “I rig them like shiners or shad, hooking them through the lower jaw and out through a nostril. You can fish them on a free line or balloon line, drag them behind planer boards or down-line them. They’re great summer baits because they stay alive in the hottest temperatures and live even when dropped into cool, deep water. Black Saltys work great in winter, too, even when the water temperature falls below 50 degrees. Black Saltys are available in two sizes. The inshore-size baitfish are 2-1/2 to 3 inches long, with approximately 30 fish to a pound. Offshore Black Saltys measure 4 to 4-1/2 inches, with roughly 15 fish per pound. They’re available through a growing network of retail bait dealers or can be ordered via Federal Express overnight shipping (Monday and Thursday shipping) by calling 1-877-GO-SALTY (467-2589). Everything else you might want to know about Black Saltys, including fishing and handling tips, is available by logging on to www.blacksalty.com.